Danish traditionalists Iron Fire have graced us with their classic power metal for fifteen years without ever once surprising us. Their sixth studio record Metalmorphosized makes no exception to the rule and will certainly polarise their prospective audiences. While some will be once again amazed by the band’s technical prowess, others will be abhorred by the music’s anachronistic nature unfit for the new millennium. I confess that I belong to the latter category, because somehow Iron Fire have lost their charm already a long time ago. I don’t question the musicians’ or the vocalist’s skills, but the album is definitely lacking moments of surprise. Most of the time Iron Fire stay in mid-tempo regions. On the rare occasions where they act a little more upbeat, as on The Graveyard, they are able to instantly create more tension. Otherwise we get mainly staid hymns with good vocal arrangements but too many guitar solos. The keyboards also are too upfront and sometimes add a twist of kitsch, as on the nearly ten minute long The Phantom Symphony. Something different can be found on the quiet Crossroads where a female voice adds some variety. Metalmorphosized is definitely preaching to the converted. 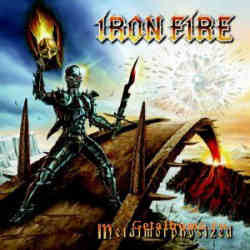 Iron Fire are still not willing to broaden their horizon and prefer to limit themselves to their small world. This attitude will certainly make it hard for them to win over new fans.